Health Canada announced that they have secured a temporary supply of AUVI-Q® epinephrine auto-injectors from kaléo to help mitigate the current ongoing supply constraints of the EpiPen® 0.3 mg dose. AUVI-Q auto-injectors were previously known as Allerject auto-injectors in Canada. Please read Health Canada’s statement and patient information sheet, along with kaléo’s statement. We’ve worked hard to help make this happen on your behalf. Since the beginning of this year, we have been working closely with Health Canada, alternate providers, and other key stakeholders to help expedite the possibility of having a second supplier in the market. Now that there is temporary supply in the short-term, we will continue our advocacy to ensure you have greater access to epinephrine in the long-term by always having more than one supplier of this life-saving medication in Canada. The AUVI-Q product will be available in pharmacies across Canada as of September 7, 2018. To address your questions about this new release, including how to access this product, how much it costs, and if it will be available beyond the temporary supply, please read these FAQs developed in collaboration with Health Canada and kaléo. 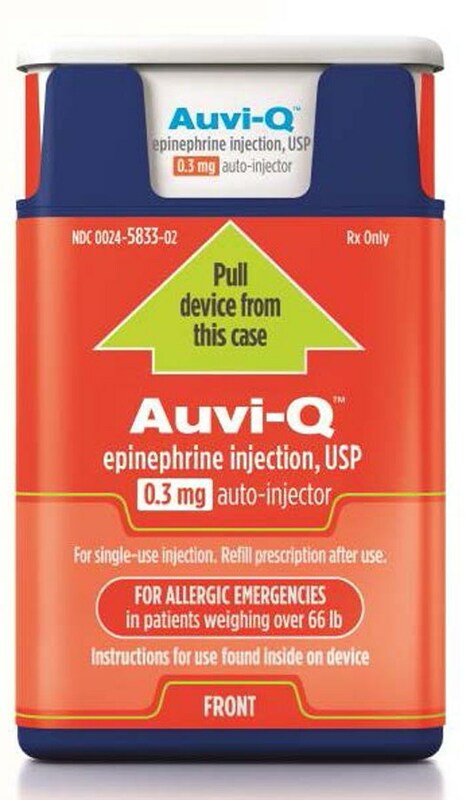 Although the shipment of AUVI-Q is expected to help supplement the existing supply, Health Canada has noted that the overall supply of epinephrine auto-injectors continues to be constrained and carefully managed. There may be a limit placed on the number of auto-injectors you receive from the pharmacy. Please continue to be mindful in requesting additional auto-injectors beyond what is necessary to allow for as many people as possible to have access to this medication. If your local pharmacy does not have any auto-injectors in stock, please check with other pharmacies in your area as limited inventory is available. If a new auto-injector is not available, a recently expired device may be used to treat an anaphylactic reaction in an emergency. As a reminder, the expiry date applies to the last day of the month noted on the device. For example, if your device expires in August, it remains valid (not expired) until August 31st. Please share this information with your child’s school to advise them of the situation, and that you may not be able to provide an additional device for the school. Follow our safety tips for managing food allergies and preventing reactions. If you have additional questions about the temporary supply, please contact Health Canada at 1-866-225-0709.